The Best Bottle Cutter in the Business! Made in the U.S.A. The Best Bottle Cutter in the Business! Cassie, Minnesota – Thank you, I received this today. The customer service at your company is out standing! Your company has always been extremely responsive and informative, I highly recommend your company to everyone that asks me about bottle cutting. It is extremely refreshing to find such an amazing company these days. I really do appreciate your amazing service. 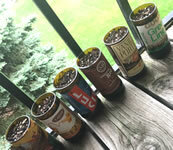 I attached a picture of just a few bottles that were up-cycled using your bottle cutter, I will have fresh veggies all summer because of your company!!! Manveen Kaur – I have been traveling quite a bit in India for workshops. 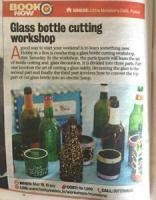 Glass bottle cutting workshop is a big hit for crafters here. People flock for the workshops to experience it (we were even featured in one of the newspaper). Nina Backlund, The Aland Islands – Finland: Hi and thanks for a next to supersonic shipment of my bottle cutter and many thanks also for a wonderful product! I couldn’t be happier and my only concern is where I will be able to get more silicone carbide powder locally. As you can surely understand I won’t be able buy it from you with an international shipping cost of $20 😉 Anyway, my first project was to turn six locally produced bottles of beer into drinking glasses and the cutting went brilliantly with your candle method. I didn’t use an ice cube to cool the glass, though. I simply held the bottle under running cold water instead, which seems to work just fine. I have also tried cutting with the front-back extender attached to be able to cut close to the bottom of a champagne bottle. Yay! Success there, too! Lori Ingwerson, Hamilton Square, NJ: Here are a few samples of my bottle craft and all of it done with your little device. I feel a little like a proud mom, excited to show off pictures of my “babies” because everything I make I make because it gives me joy. It is a hobby that occasionally makes me some money, too. This weekend I’ve been hired to do a DIY party to demonstrate bottle cutting. To be sure, I’ll let them how much I love the Ephrem and encourage them to get one of their own. From Susan Miller: “I spent my winter in Southern Chile, where my son has a hostel for adventure travelers (just returned this week). I knew from previous experience that there is no recycling there, and that a lot of wine and beer are consumed. I took the bottle cutter down with me, with various ideas of how I would use it–after I had replenished the drinking glass supply in the hostel. (We are the envy of the other establishments in town). As it turned out, I put it to very good use. The town and the wild river that attracts people from all over the world is threatened by the possibility of a gold mine up river, along the shores of a beautiful Andean lake, and locals and the rafting/kayaking community there began strategizing ways to possibly discourage establishing the mine–a town across the border in Argentina was successful in doing that several years ago. I got the brilliant idea of making bottle glasses with mottoes against the mine, which could be sold to raise awareness in the town, and to raise money for some of the inevitable expenses involved in community education. So I became the “mad bottle cutter’ of Futa (Futaleufu, the town and the name of the river). I had brought down a couple of gold markers, which I had planned to use decoratively to sell bottle glasses or vases to tourists or other hostel owners; instead I used them to paint positive messages, each ending with “NO a la Mina!” I donated the decorated bottle glasses (over 60) to the committee to sell to raise money for some of the inevitable expenses they’ll have. And I donated the cutter and taught a couple of people how to use it so they could be replenishing their supplies during the next 6 months until I come back– probably bringing several cutters with me then. From Ron and Holly: “Just cut our first glass. Went smoothly”. From George: “I’ve had real good luck with the kit and have made a bunch of very nice luminaries for my backyard”. From Julie: “I can’t believe how well the bottle cutting went!… My husband even joined in and we had so much fun”. From Keith: “Package received yesterday. I needed only five minutes and one practice disaster to make a clean square cut. Well done little piece of equipment!”. From ‘G’: “so…first thing I want to say is…you’re a genius… for real…this is a great product…and I can’t believe its as easy as it is to use…it does exactly what it promises and does it well…what a great product. Its rare to find quality products, and which perform as promised…am very pleased with Ephrem’s Bottle Cutter”. From Lori: “My fiancé Josh and I really enjoy using your product. While it certainly takes a bit of time, the result is amazing—and we’re actually saving a lot of money by re-using our (and our friends) empty wine bottles”. 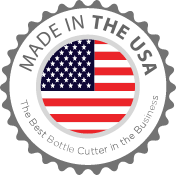 From Avrill: “I have enjoyed my bottle cutter tremendously. I had an Ephrem as a teenager which my Mom and I enjoyed. I’m now a 60+ year old with a creative bent, and your bottle cutter is the absolute best!!”. To honor our “Made in the USA” label, free shipping in the USA for all orders greater than $20.00. For the rest of the world, an additional $30.00 will be added to cover shipping charges. Overseas shipments will be by international airmail. There may be additional import duty charges by the particular receiving country.